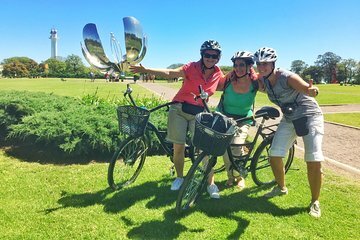 Cycle through the Recoleta and Palermo neighborhoods with a small group and guide during this 4-hour tour. Stop at the Evita Perón Monument, Recoleta Cemetery, and the Rose Garden. Bicycles (beach cruisers) and helmets included. Make your way to San Martin Square to meet your guide and small group. After a brief orientation, get fitted for a beach cruiser-style bike and helmet, then pedal off through the surrounding neighborhoods. Follow your guide through Palermo, Buenos Aires' largest neighborhood, and Recoleta, the city's most affluent neighborhood. Learn about these areas through stops at the local landmarks, such as Floralis Genérica, Barrio Parque, the Rose Garden (15-minute break), and the Planetarium. Hear about the city's history as told through monuments such as the Evita Monument and the Spanish Monument. Your last stop is at Recoleta Cemetery, where your guide will lead you on a 30-minute walk before pedaling back to the tour's starting point. I would rate this as a B. Bikes were ok but not great. Tour guide took us mostly on bike lanes through the city Its not terribly bike friendly yet . I felt like we quickly passed a LOT of interesting sites without stopping or discussion. There were only 4 of us in the group but the leader wasnt very aware when we tried to ask questions. We took two 15-20 minute rest breaks that werent really needed I feel the guide was just trying to use up time. We made about 4 or 5 stops, the longest was at the Recoleta Cemetery, which was very interesting and for which she was very knowledgeable. Did the tour of north BsAs at the end of my holiday here and wish I had tried it earlier, so that I could have done another with them. Our guide, Gisela, was superb - taking us at a leisurely pace along safe cycle tracks and stopping regularly to point out and explain the many wonderful, often hidden, buildings, statues and monuments, along with their fascinating history. Stuff you would never find in the guide books. Will do the full tour next time. Terrific tour of the city. Nicely paced and easy to bike. Knowledgable guide and well maintained bikes. Tour did a decent job hitting the highlights. We took mostly the same route there and back as opposed to seeing new things. In addition, we had one guide covering multiple languages as opposed to an english specific group, which resulted in wasted time as we sat there while he covered the other languages. Lastly, the bike was not that comfortable.